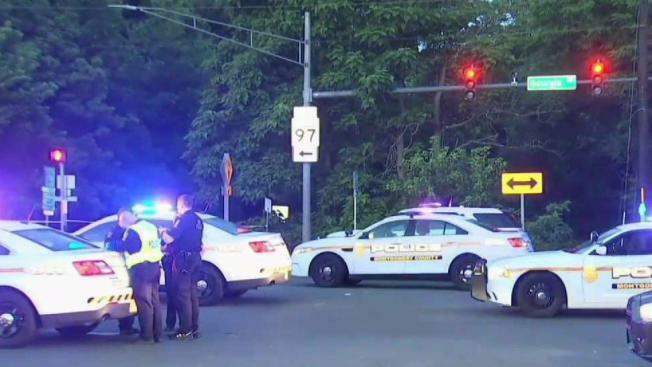 A 15-year-old girl has been charged with murder after police say she and two other suspects assaulted a man and watched as he was hit by a vehicle in a busy Aspen Hill intersection, Montgomery County police say. Ashley Bonilla of Silver Spring has been charged with first-degree murder and armed robbery in the death of 40-year-old Gregory Jonathan Atwood, police announced Wednesday. Mohammed Salous, 17, and Kenneth Kpakima, 21, were charged in the case in June. On June 8, Bonilla, her Kennedy High School classmate Salous and Kpakima were seen in the area of the 3300 block of Hewitt Avenue trying to open the doors of parked cars, investigators said. They encountered Atwood, who had disabilities, about 3:15 a.m., police say. The trio stole his backpack, and he followed them, demanding they return it, according to court documents. He was then beaten with his metal crutch. Bonilla threw a full can of beer at his head, investigators said, and Atwood collapsed. The trio stole Atwood's backpack, assaulted him and watched as he fell backward into a wooded area next to the intersection of Georgia and Hewitt avenues. Salous and Kpakima followed the victim into the woods and continued to beat him, according to police. Kpakima then took the victim's wallet. Police say the entire assault was captured by a nearby surveillance camera. Desperate to get away from his attackers, police say Atwood crawled out of the woods and toward Georgia Avenue, where he collapsed in the roadway. Police say Bonilla, Salous and Kpakima watched as Atwood was run over by a vehicle. "At one point, he crawled out of that area in an attempt to get away," Montgomery County police Sgt. Rebecca Innocenti said. "He went on to Georgia Avenue, collapsed there, remained motionless, and that's when the suspects watched him get struck by a vehicle." Police believe a second vehicle may have also hit Atwood. Police said surveillance video shows the suspects returning to parking lots moments later and trying to open unlocked cars. All three suspects left the area before officers arrived, police say. Atwood died from his injuries, and his death was ruled a homicide by the Medical Examiner's Office. Police say Salous has been charged with assault-related offenses and murder. Kpakima has been charged with assault and armed robbery. Bonilla was charged as an adult with first-degree murder and armed robbery. Police are also still looking for the drivers who struck Atwood. Anyone with information that can help police is asked to call 240-773-6620.